One former House staffer told me of a 2003 meeting hosted by Rep. Jack Kingston where Gingrich spoke. Kingston would regularly host “Theme Team” meetings with a few Republican congressmen and some of their staff. Just before the House vote, Gingrich was the special guest at this meeting, and he brought one message to the members: Pass the drug bill for the good of the Republican Party. Conservatives were worried about the potential for cost overruns, and about the credibility of their limited-government arguments if they passed this new entitlement bill. 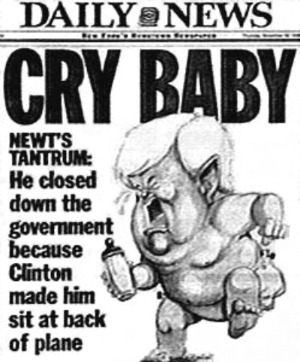 “Every concern that members raised,” the former House staffer told me, “Gingrich would respond with a poll number.” Gingrich invoked the American Express motto “Don’t Leave Home Without It,” and told Republicans they could not afford to go home for recess without some Medicare drug bill — regardless of the content. This entry was posted in 2012 Elections, broken government, campaign finance, Congress critters, corporate power, corruption, Government, Medicare, Politics and tagged broken government, corporate power, corruption, elections, lobbying, Newt Gingrich, republican. Bookmark the permalink. And it struck me the other day, how Newt has this “gifted” way of saying things from a spot no that one but him ever goes. “Child-labor will grow the economy” f.ex. Yeah, sure! It has a weird comedy quality to it – if you disregard that he sort of actually means it. Let us not forget he’s the right’s reigning intellectual giant.